Western blot analysis of extracts from various cell types using CDK7 Antibody. 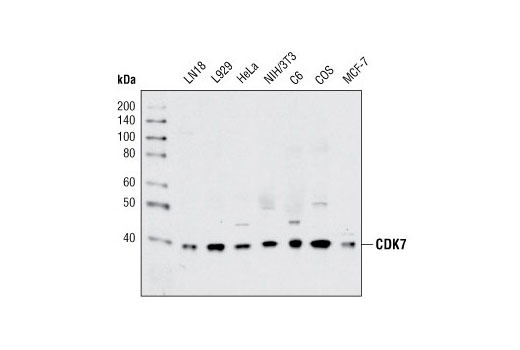 CDK7 Antibody detects endogenous levels of total CDK7 protein. Polyclonal antibodies are produced by immunizing animals with a synthetic peptide corresponding to the amino terminus of human CDK7. Antibodies are purified using protein A and peptide affinity chromatography. CDK-activating kinase (CAK) is a complex of CDK7 and cyclin H. The complex is involved in cell cycle regulation by phosphorylating an activating residue in the T-loop domain of cdks (1). Regulation of CAK activity is mediated by T-loop phosphorylation and by association with MAT1, both of which enhance its kinase activity toward the CTD of RNA polymerase II (2,3) and other substrates such as p53 (4). CAK is an essential component of the transcription complex TFIIH and may interact directly with TFIIH helicases (5). Larochelle, S. et al. (2001) EMBO J. 16, 3749-3759. Yankulov, K.Y. et al. (1997) EMBO J. 16, 1638-1646. Ko, L.J. et al. (1997) Mol. Cell. Biol. 17, 7220-7229.